Largest online selection of Industrial NG/LP Three Phase generators from Kohler. These generators are propane or natural gas fueled. NG & LP generators, 25,000 watts (25 kW) to 180,000 watts (180 kW). Gaseous engines from Doosan, GM, PSI & PSI Heavy Duty. 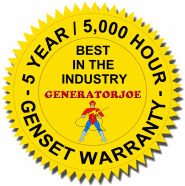 World Famous Kohler generators at a competitive price. Kohler, Defender™ Series, 40 kW (50 kVA) 60 Hz, SKU KODF-040T303, Model 40REZG-3, (Open, No Enclosure), Enclosures Optional, Use Request Price Form or Call for Instant Quote. Kohler, Defender™ Series, 50 kW (63 kVA) 60 Hz, SKU KODF-050T304, Model 50REZGB-3, (Open, No Enclosure), Enclosures Optional, Use Request Price Form or Call for Instant Quote. Kohler, Defender™ Series, 60 kW (75 kVA) 60 Hz, SKU KODF-060T305, Model 60REZGB-3, (Open, No Enclosure), Enclosures Optional, Use Request Price Form or Call for Instant Quote. Kohler, Defender™ Series, 80 kW (100 kVA) 60 Hz, SKU KODF-080T306, Model 80REZGD-3, (Open, No Enclosure), Enclosures Optional, Use Request Price Form or Call for Instant Quote. Kohler, Defender™ Series, 100 kW (125 kVA) 60 Hz, SKU KODF-100T307, Model 100REZGD-3, (Open, No Enclosure), Enclosures Optional, Use Request Price Form or Call for Instant Quote. Kohler, Defender™ Series, 125 kW (156 kVA) 60 Hz, SKU KODF-125T308, Model 125REZGC-3, (Open, No Enclosure), Enclosures Optional, Use Request Price Form or Call for Instant Quote. Kohler, Defender™ Series, 150 kW (188 kVA) 60 Hz, SKU KODF-150T309, Model 150REZGC-3, (Open, No Enclosure), Enclosures Optional, Use Request Price Form or Call for Instant Quote. Kohler, Defender™ Series, 180 kW (225 kVA) 60 Hz, SKU KODF-180T310, Model 180REZXB-3, (Open, No Enclosure), Enclosures Optional, Use Request Price Form or Call for Instant Quote.